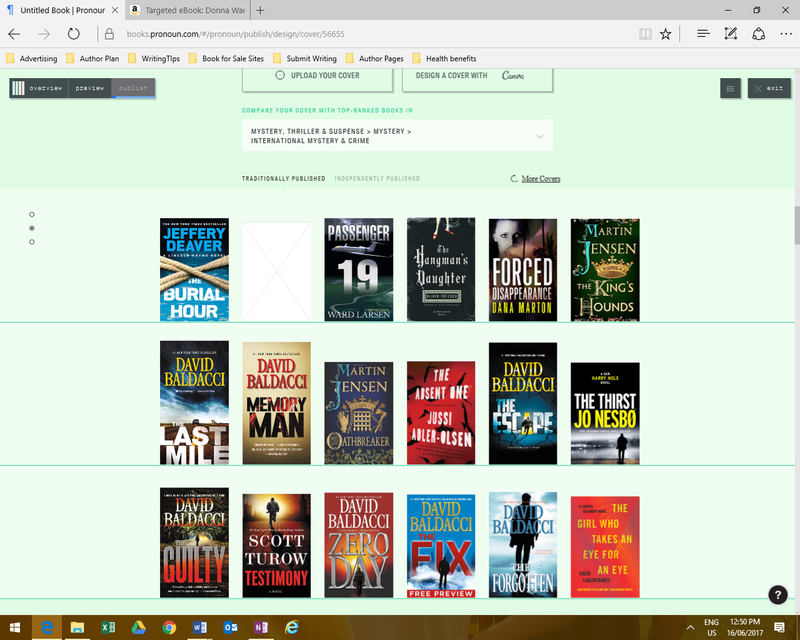 I am going to use the book cover comparison feature of Pronoun’s book publishing application to help understand which design elements are trending in the International Mystery and Crime category. 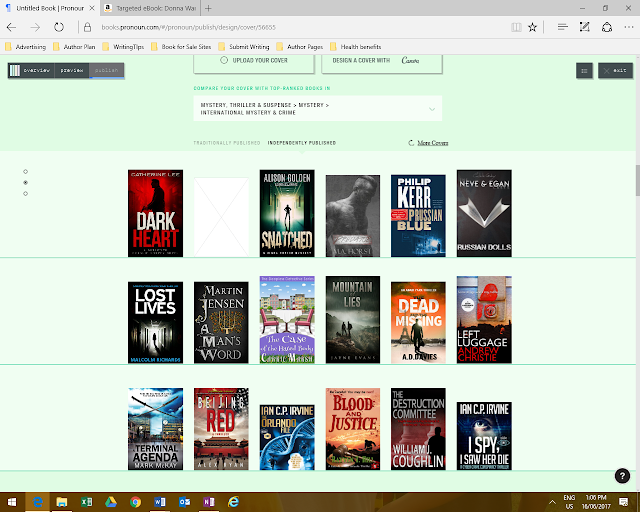 I used Pronoun to prepare my Dark Fantasy novel, Girl Desecrated, for publication, and many features such as category comparison, placement, keyword achievability and popularity, all helped me place my novel in the best position of discoverability for my target reader. In this research, I’m looking for trends and consistencies in the book covers of the International Mystery and Crime category to determine how to best design a book cover for this genre. I have taken screen shots of Pronoun’s view of top ranking book covers of both traditional and indie published novels. I should note that many top-ranked traditionally published books in this genre are by the same author, David Baldacci, which could lead to false consistency in some of these design features. To ensure my conclusions were consistent with many authors, I dug down into Pronoun’s second and third pages and found the same conclusions were consistent. Background: Note the lack of background images compared to other genre novel covers, like Epic Fantasy and Sci-Fi, genres in which world building is important. Generally, these Mystery and Crime book covers have backgrounds that consist of an outdoor scene, with journey or escape motifs (broken fence, long roads, winding rivers, plane routes, ropes etc.) The background colours and images have vignette or gradient filters applied, which brings the dark edges inward. People: A few covers show people, but much less than the Romance genre. Close-ups that are popular in Paranormal Fantasy book covers are rarely used here. The people in these book covers are generally shown from the back, in silhouette, and in active running, walking or reflecting poses. Font: Text is generally large block, sans- serif fonts in bold colours, with strong contrast between the text and background. The use of such large fonts is partly possible allowed by the short titles, which often begin with the word “the”, which can be reduced in size. The Burial Hour, The King’s Hounds, The Hangman’s Daughter and The Absent One are three-word titles. Memory Man, The Escape, The Thirst etc., two words. Colour Template: Standard colours are red, orange, yellow, grey, black, white. You can see how the design of independent novels move outside of the consistencies found in the traditionally published novels. Out of the 17 examples of top ranked independents in this genre, only six novels follow the traditionally published elements determined. Blood and Justice and The Destruction Committee come close, but the execution of the design is interfering (poor contrast, etc.) and so these books are unable to visually hold their own in the genre’s design pattern. The rest of the novels may feature some of the consistent elements, such as a silhouette, but not in a combination of elements that would show a consistent genre design. I’m going to ignore Martin Jenson’s novels, because the design screams “historic fiction” and I’m going to assume, this is Jenson’s sub category. The Hangman’s Daughter, and The Case of the Hate Body are designed more like cozies, so I’m also going to ignore those covers. The books that are designed much differently than the traditional majority, and which seem to belong to this category, do not show a consistent pattern of design amongst them. Two books are very minimal (Russian Dolls and Predator), two are busier in terms of background (Beijing Red and Terminal...) and two seem more like Sci-Fi genre designs (I Spy and Orlando File). These book designs are too dissimilar from each other to conclude a new International Mystery and Crime genre cover pattern might be evolving. After looking at top ranked sellers in both traditional and self-published, I would conclude “blue” is an uncommon colour for this genre, purple and green even more so. Decorative fonts are not common, nor is characterization in the cover. Setting seems important, but more in a symbolic sense that lends a hint to the thriller plot. Colour combinations are bold and bright for text, with subdued backgrounds, shaded to produce atmospheric tension in the viewer. The Pronoun application offers authors data, which can then be turned into useful information. As authors, we can access these tools and learn very important lessons that our readers already know… specifically what does a cover promise. Consistency in those cover designs exists because the reading audience has been conditioned to equate a visual with content they enjoy. If, as book designers, we deviate from trending visuals, we stop communicating promises to our readers. And that, in turn, will affect sales. The bottom line, if you have a book in the Mystery, Thriller & Suspense > Mystery > International Mystery and Crime category, design your cover using the same elements David Baldacci's designer is using.